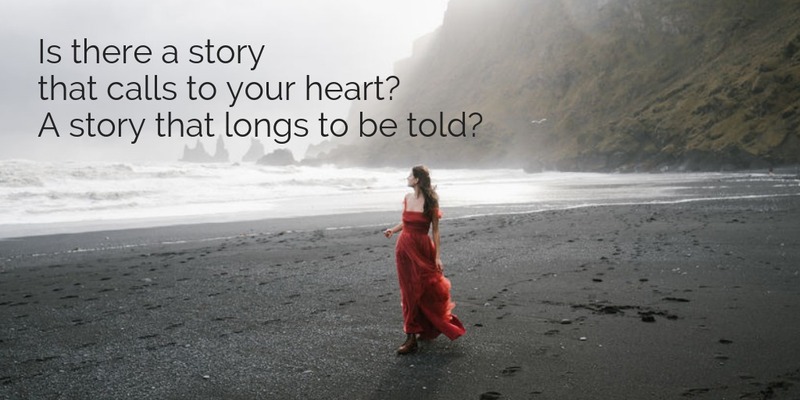 How long have you been waiting to tell your story? Not a week (rarely a day) goes by when I don’t hear from someone out there in this wild world of ours, someone just like you. Someone with a regular, ordinary, mundane life. Someone with joy and bliss and heartache and grief. Someone with trauma and fear. Someone struggling against demons. Someone determined to rise. Every single one of these someones has a story. Every single one of these stories has value. And every single one of these someones has one thing in common. The someones that reach out to me, by email or message or social media comments – they want…no, want is not a strong enough word right now – they long – to tell their stories. Somewhere deep inside there is a pulse of desire. A kernel of an idea. A sweet and lingering pull toward the blank pages of the journal, the blinking cursor in the word doc, the empty spaces waiting to be filled. Sometimes just to the very idea that somewhere inside of them lives a story worth telling, a story someone might one day want to hear. Possibly even a story that could matter, that could change things. A story that could delight or distract or make someone on their darkest nights feel just a little less alone. Maybe even a story that could save. I said that these someones have one thing in common. That wasn’t quite right. It wasn’t quite right because of course there is more than one thing. There is this universal thread that stitches these souls together. It weaves in and out through countries and across oceans, around the curves of different languages and customs, through the years of age and space and time. That thread is the call of stories. The nameless pull to bookstores where you get lost for hours in the feel of pages turning in your hands, where you press books to your nose and breath in the smell of paper and ink and the dreams of whoever strung the words together and bound them into the world you’re holding in your hands. The siren song that brings you together with others like you, where you slip-slide through stories, voices trading and growing softer and more true as the night darkens around you and the veils slip away. It is said that a writer lives things twice. Once in the living, like everyone else. And once again in the telling. You, sweet someone, live your stories again and again and again, even if you’ve never put them down onto a page. You turn them over and over in your mind. You layer them upon your heart. A poem crosses your path and a line or maybe just a word jumps out and you feel this thrill of recognition, because it means that somewhere in this vast and lonely world, that poet (likely someone you’ll never meet, maybe even someone not on this earth) in some moment knew *exactly* the thing that you feel to be most true. You know the exact page on your favorite book where the author wrote those words that brought you to life, or maybe even saved you. You’ve scribbled words on grocery store receipts or in the notes section of your phone or just etched them onto the deepest parts of your heart. You visit old bookstores like some visit church, and inside the pages of story you find penance and community and redemption and salvation. You’ve probably been this way since you were very little and you got lost in the pages of books or told your teacher or your parents that you would one day grow up to be a writer. You’ve learned that there are many you can’t share this with. The people who will look at you with amusement and condescension. The ones who will tell you that art is not a sensible way to make a living, and words even less so. The people who will tell you that your story isn’t interesting enough to turn into a book, or that it’s already been told a million times over. The ones who red pen slash the most tender spillings of your heart. Perhaps, it is also quite likely, that all of those people above – and all of their very loud voices, live inside of your own head. If you’ve been reading this without being able to look away. If you’ve been reading this and you’re heart has been beating in recognition. If you’ve been reading and those loud voices are telling you it couldn’t possibly be about you. I want you to stop right now and take a breath. I want you to pretend you are sitting right here with me today in my living room. The light is bright through the old paned windows. There is a deep blue mid-century sofa and bright mustard yellow cushions. On the table are mason jars filled with sunflowers and bright red blossoms. There is a fan blowing in the corner to keep us cool and a soft voice crooning love songs playing on the speakers. A candle is lit and it smells like amber and roses. I want you to bring yourself here with me. Right here. I want you to turn to face me and to look me in the eye. I’m going to reach out and take your hands now. Both of them. I want you to breathe with me, all the way down to your toes. And I want you to listen like you’ve never listened before. You are here today because you have a story. You are here today because something deep inside you knows you need to write it. You may have written me before to tell me this, or you may have started to several times and stopped yourself. You may have only told your best friend or your lover. Or maybe you’ve never told anyone at all. You know because the words have been piling up against the levees for so long now that it’s a wonder you can hold them in. You know because the dams have been threatening to break and to spill a flood of story. You know because there are oceans of worlds inside you that long for nothing but the chance to finally, finally, finally taste land. You know because it has always been this way. And you know that it always will. And I know that this matters. That it matters more than almost anything. And I know that there are others out there like you. Others who are waiting to tell their own story, and others that need more than anything for you to tell yours. My work in this world is to create a space for this to be real, for you and for all the someones out there like you, Wild Heart Writers, one and all. In just a few short weeks, a wonderful, ragtag group of someones from all across the globe will gather. We will sit around the campfire and for 30 days we will tell our stories. We will open our hearts. We will open the dams and let the waters of words flow. And we will finally, finally get to feel what the ocean feels when it crashes on the shore, moving the entire cosmos with the force of it’s being. Your story is waiting for you.